Everyone works at a different pace, and every project has different challenges, so there is no way to estimate how long it might take to do a job like this. It really depends on your schedule, mission creep, and how perfect you want the final result to be. Mission creep is difficult to control. Repair work nearly always uncovers additional work needed. I try to make a detailed list of repairs, then try to stick fairly close to that list. Preparation for painting is one area I simply do not have enough patience. The final finish appearance is directly linked to how well the prep work is done. I tend to get in a hurry and cut corners here, so my paint jobs often look a bit rough. You may have heard this called a 20:20 paint job, "It looks great at 20 miles an hour or from 20-feet away". 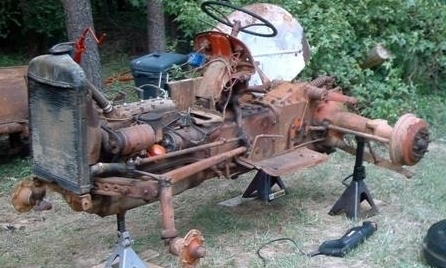 As far as I am concerned, this is an acceptable look for a working tractor. 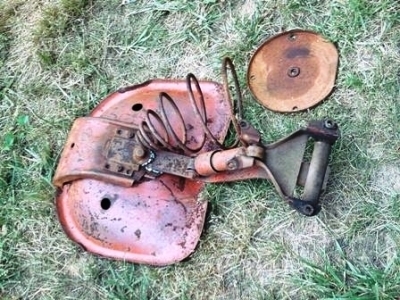 A perfect finish is not nearly as important to me as getting something on there to prevent rust, and a perfect finish will not stay perfect for long on a working tractor. Working outside has a weather penalty, but one huge advantage is it cuts way down on the fumes I have to breathe. One seemingly unavoidable issue with painting outside is BUGS! More than a few small varmints were entombed in the paint on this one! This is not a RESTORATION. A true restoration would require complete dissassembly, cleaning, and repair or replacement of any parts showing the least sign of wear. 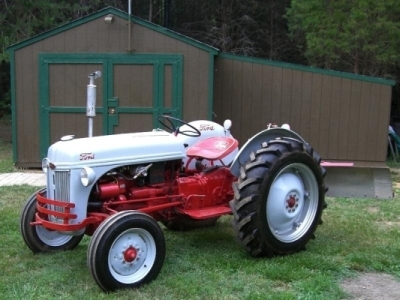 I just wanted a good looking tractor that I wouldn't be embarrased to own. It was not necessary to go to the level I did. Many people might simply mask the areas that are different colors. Taking things apart is often a LOT easier than putting them back together, so don't get carried away. 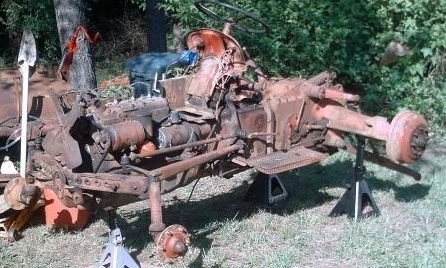 Many projects like this fail because the original dissassembly goes beyond the ability of the owner to reassemble it. I started out planning to remove broken parts and the items I did not want to be painted red. I also wanted to paint areas between panels that didn't get done the last time someone painted this tractor. First, start draining the fluids into appropriate containers for recycle or proper disposal. The hydraulic/gear lube sump has three drain plugs. It usually works best to start with the relatively small 3/4" pipe plug at the bottom of the differential. This limits the flow to a managable amount. This sump holds 5-gallons so you will need to stop and empty your drain pan if it won't hold 5-gallons. The fuel drains easy, just remove the fuel line, put a short piece of tubing on the end of the fuel line, set a container at the end of the tubing, and open the fuel valve on the bottom of the tank. While the fluids are draining, start taking lots of pictures. It's a good idea to take pictures as you take things apart because it could be months before you get around to putting it back together. My memory was never that good. I use various sizes of clear plastic jugs to put nuts, bolts, small parts, and brackets in as they come off. That way I know I have them all. But sometimes it can be a little hard to figure out what went where. Photos of things like the throttle linkage can save you a lot of head scratching later. A few labels on parts are not a bad idea either (hint-hint). Once you have your first set of "BEFORE" photos, start removing things like bumper, grill, headlights, and battery. It is actually much easier to wait until after you have the hood off to remove the headlights, but you will have to disconnect the wiring before you can remove the hood. Remove fuel line, exhaust, and radiator cap. With those out of the way, the hood is attached with a bolt on each side near the bottom of the radiator, and four bolts around the dash. The bolts at the front also catch the hinge points for the grill. So, as you remove the first bolt slide the grill out and put it out of harms way. The hood is not impossible for one person to lift off. But it is very awkward. You might want to get some help or rig some kind of pulley from overhead. I don't like trying to mask things like tires. Its a lot easier for me if I just get them out of the way. A good set of jack stands makes this a lot easier. But be Careful! Make darn sure you have good level footing under your jack stands, and don't use cinder blocks to support heavy weight. They can and do crumble to dust with no warning. A good safe alternative to cinder blocks is heavy wood timbers. Many tractor tires have been filled with a solution of calcium chloride and water, or some other form of antifreeze and water. Filled tires are HEAVY. The liquid adds as much as 350 pounds per tire! If one of the rear tires should get away from you, it could do a lot of damage to you, or the surrounding countryside. My "trick" for removing most tires is to loosten the lug nuts and jack it up until the weight just barely comes off the tire. Then carefully slide it off the lugs and roll it away. Next I removed the seat assembly. Its easy to remove, usually only two bolts. This one was a little more complicated. Each fender is attached with two long carriage bolts that also hold the plates under the axle for the outer sway braces. These bolts can be nearly impossible to remove. If the carriage bolt starts spinning, all you can do is get a torch, grinder, or hack saw. Two of mine snapped and I had to cut the other two. In some cases, the easiest solution is to simply overtighten them until they snap. Next remove the radiator hoses and radiator. The radiator is held in place by two captive carriage bolts at the bottom. There are supposed to be two rubber pads between the radiator and the frame. Mine were missing, you will probably want to buy new ones whether yours are there or not. Remove fan belt, wiring, and gauges. Then it's time to start scraping, power-washing, and sanding. Some people use a portable sand-blaster but I don't like getting sand EVERYWHERE, so I generally stick to the manual methods. My philosophy is that any paint that survives this process is stuck good enough to just stay there. Once cleaning and scraping is done, I like to shoot a coat of primer especially on all bare metal. This helps me spot any areas that need more attention, before I start spraying real paint. The dash had to come off so I could clean out a pack rats nest behind it. Got rid of several years worth of nest-building, nuts, droppings, etc. 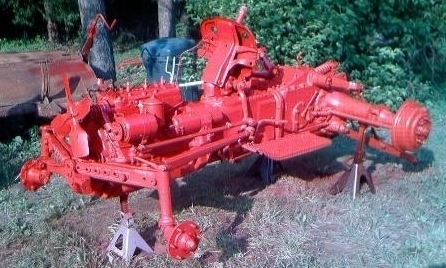 Here is BUGS, after painting two coats of RustOleum Sunrise Red No.7762. The following link will take you to my page of painting and color information. I guessed it would take about two quarts of each color and this worked out almost perfect. For my paint gun I thinned the paint about 5% with mineral spirits. I did not add any hardener or other ingredients. That is the stuff that can be really bad to breathe so I skipped it. I shot the first coat at about 40-psi, with the pattern as tight as it would go and a little on the light side to keep me from getting too much paint in the first coat. I was not concerned about coverage, just wanted to get a good tack-coat down. My original plan was to apply the second coat within 24-hours. But the rains set in for three days, so I had to leave it covered with a tarp. By the time the weather dried out the first coat was completly cured so I applied a second light coat. I let that get nearly dry and then opened up the pattern a bit and increased the volume of paint for a third pass. By now I was getting a little more comfortable with my spray gun and had a better idea how much paint I could apply without runs, drips, or sags. 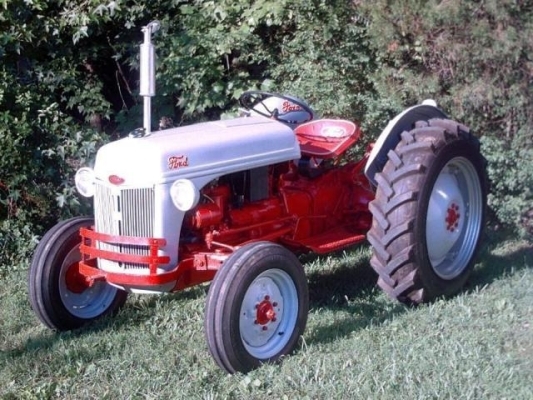 Small parts like the battery tray, dash, and air filter are easier to paint off the tractor. I installed a new rubber grommet for the steering column before reinstalling the dash panel. 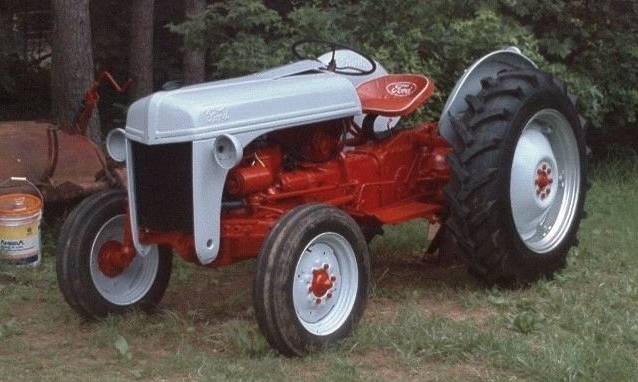 The sheet metal on this tractor was fairly straight and it has the Ford script embossed in the rear fenders. Minor dents were fairly easy to straighten. 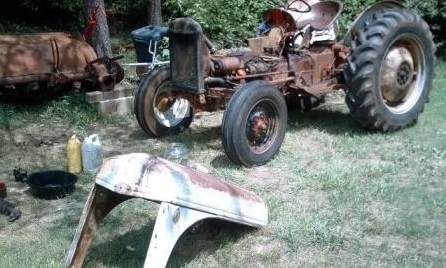 Sadly, the rear fenders were badly rusted in the area under the braces. Not completly gone, but bad enough that they could not be patched. Again, this is not a restoration, so I just hammered out the dents, got rid of the loose rust, shot a couple coats of primer, and then three-coats of light gray. The seat that came off this 52-8N is an aftermarket seat with a shock absorber and a big coil spring. All the rubber bushings and hardware were completly shot. I scrounged some universal sway bar end link kits at the local auto parts store. The long bolt and rubber bushings in the kit were perfect to replace the rotten parts on my seat. After putting this seat back together, it is noticably more comfortable than the original seat. If I was planning to spend many hours in the seat at a time, it would be a very welcome accessory. But my seat-time is usually measured in minutes, not hours, and I prefer the look and simplicity of the original flip-up seat. The PTO shaft was leaking badly. This is the original 1-1/8" shaft but it was showing very little wear and the bearings seemed nice and tight, so I just put a new seal and gasket on it. This would have been a good time to get a new 1-3/8" shaft but everything I have either connects directly to the 1-1/8" shaft or uses an adapter. I have also heard that the original shafts were made out of better steel than many of the new replacement shafts. A quick inspection of brakes revealed a nearly new set of shoes but they needed a thorough cleaning and adjustment. The hub on one side was loose which could ruin the hub and axle if left loose. I put my big breaker bar on it and got the nut torqued back down to 400-450 foot-pounds. Hopefully, that fixed it but I will have to keep an eye on it. 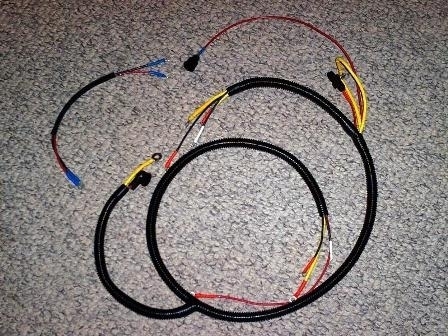 This is the new wiring harness I re-manufactured. It is not hard to make one from scratch. With the old harness laid out on the floor, it is easy to match the original size wires and cut to the proper length. You can scrounge new rubber boots from a variety of sources. Please try to match the original color code as close as possible. I used colored heat shrink to match the color stripe on the original wires since my new wires were all solid color. A new weatherproof harness should last at least as long as the original. I decided to stay with the 6_volt system for now since the ignition, starter, and charging systems were working fine when I got it, in spite of the fact that the wiring harness was a total disaster. 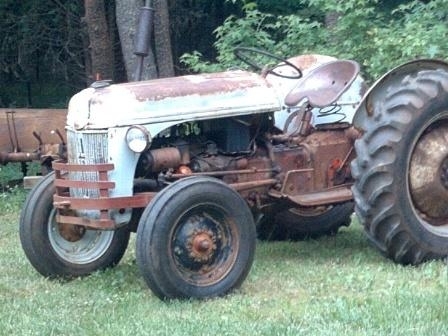 Once you are hooked on old tractors, it is a never-ending process. 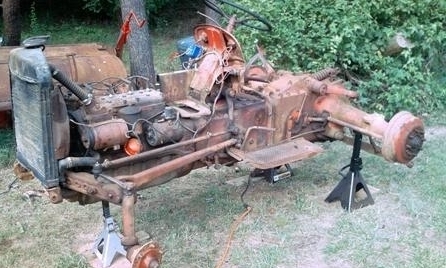 Midway through the work on this tractor, it became obvious that there were some things on my 49-8N that could have been done better. 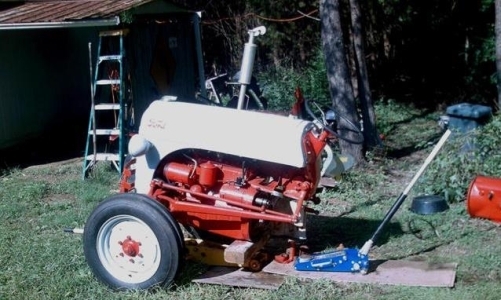 Then, once I had two good tractors, I started to notice differences in how they operated. 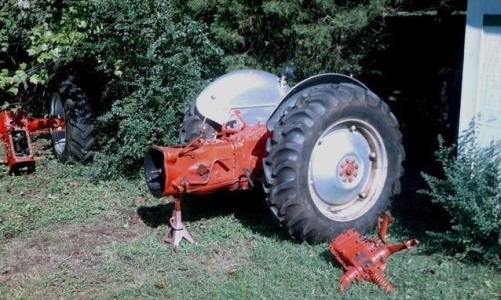 Defects that I might not have noticed with only one tractor suddenly became painfully obvious. So, not long after completing this project, I discovered that the transmission/rear-end in the 52 was in bad condition and the engine in the 48 was noticably weaker than the 52. 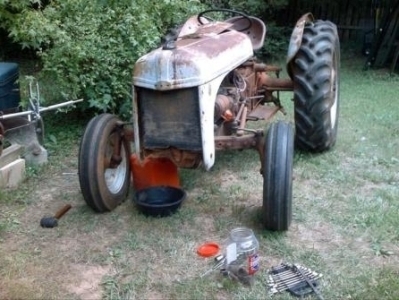 So, I ended up dissassembling both tractors again and putting all the best pieces together into one good working tractor. These tractors are surprisingly easy to work on. Even the major thrash I just described, took less than two full days to complete. Of course, the way I have to fit it into my other work and the weather it spanned three weekends.